Hot enough for you? It has been a sizzling summer in most parts of North America, and even the most skeptical among us has been forced to admit that climate change is real. 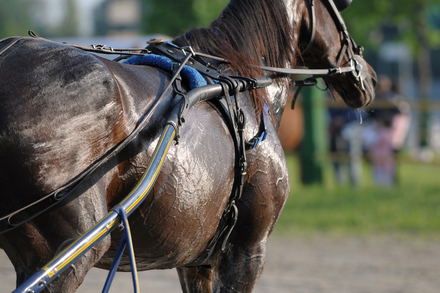 Regardless of the reason, keeping your horses cool is a challenge for many horse owners. As temperatures have soared, it hasn’t been only humans who have had to cope; our horses, who are better adapted for cool climates than scorching ones, have also been challenged. 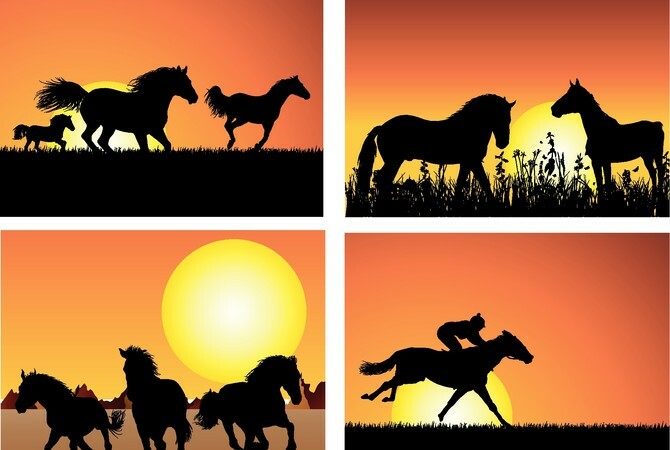 Despite their ability to sweat – a relative rarity among animals other than humans – horses still have difficulty cooling themselves when temperatures become extreme. Because of their large size, their body heat tends to accumulate faster than they can get rid of the excess. Especially in conditions of high humidity, when sweat no longer evaporates to cool the skin, horses are prone to heat exhaustion and heat stroke, which can be extremely dangerous. Few of us have the luxury of an air-conditioned barn, so how can we best offer some relief to our horses when the mercury skyrockets? Using ceiling or box fans to help keep air circulating. Evaporative cooling has a long history; frescoes dating from 2500 BC show slaves fanning jars of water to cool a room. The transition of water from liquid to vapor through evaporation, can reduce the ambient temperature using much less energy than does refrigeration or air-conditioning (also making it far less expensive to run). And in dry climates, evaporative cooling also introduces some much-needed moisture into the air. No wonder this form of cooling is popular throughout the American southwest, and in other arid climates, like parts of Australia. In humid climates, evaporative cooling is less effective in cooling the immediate area, but it still stimulates air movement and provides some comfort when horses come in direct contact. In addition, misting systems repel flying insects and reduce the level of dust and airborne particles in the environment, making them beneficial to equine respiratory health. 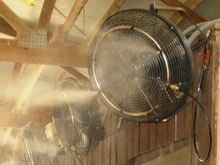 A misting system, when installed in a barn, introduces a steady supply of water to the air in the form of ultra-fine droplets which evaporate before they hit the ground. A correctly installed misting system creates a curtain of mist, which can reduce temperatures in the immediate area by as much as 20 to 30 degrees Fahrenheit (depending on the outdoor temperature and relative humidity). These systems utilize a high-pressure pump to create a fog that uses natural wind to cool the area. The best results from a misting system are achieved when the mist is produced in an area which already has good airflow. Otherwise, the mist may not evaporate fully and your walls, floors, and fixtures will be damp. Many people like to install a line of misting nozzles just under the eaves of the barn, directed out at a 45 degree angle rather than pointing straight to the ground. The best placement, however, might vary depending on the design of your barn. Just make sure the misting nozzles aren’t in proximity to things which need to be kept dry – such as tack, feed, and salt blocks. Permanent misting systems rely on a central pump which is connected to your water supply. The best of these are designed so they are sealed against dust, rodents, moisture, and corrosion damage, have auto-shut-off valves should the water supply be cut off, and are easy to service. Some misters also have timers so you can choose when the mist is delivered, and some allow you to mist horse-friendly insecticides for barn-wide fly control. Most misting systems amplify the water pressure over and above what you normally receive from your city water system or well, in order to achieve the fine-mist or fog effect. If a permanent misting system doesn’t suit your barn (or your budget), you might want to invest in some portable misting fans, which come equipped with a water reservoir or connect to a hose. There are even retro-fitting kits which can convert a suitable ‘ordinary’ fan to a misting fan. Cost effective low pressure systems use standard hose connections along with the cooling fan. The advantage of the portable option is that you can set the fans up where they are most needed, and move them around according to the seasons and the time of day. Many farms in the southwest employ misting systems outdoors, too. Consider running a line of misting nozzles along a fence line for the hottest days; you will soon find that your horses line up to enjoy the cooling mist. Whichever option you choose, electrical safety has to be a priority. Should there be extension cords, make sure they are the heavy-duty, outdoor, three-pronged variety, preferably rated to be used in moist conditions. Resist the urge to wrap the cords around any metal fittings in your barn, such as stall grilles – instead tie them in place (and out of reach of equine teeth) with binder twine or plastic zip-ties. If you’re installing a permanent system, spring for wiring encased in moisture-proof conduit (which has the added perk of being rodent-proof). Making your barn low-risk for electrical fires is an expense you will never regret. Will suffer muscle tremors, spasms, or even seizures. Dehydration compounds the symptoms of heat exhaustion, so offer fresh, cool water to drink – but be aware that a severely dehydrated horse may lose his thirst reflex, so you may have to get a veterinarian to administer intravenous fluids in some cases.